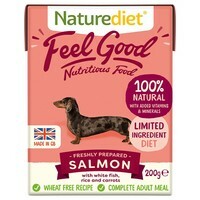 Naturediet Feel Good Salmon is a high quality, complete and nutritious meal made with freshly prepared Salmon, White Fish, Rice and Vegetables. Gentle on digestion and developed to eliminate meat proteins which may be the cause of allergies, this irresistible steam cooked meal is also high in natural omega 3 fatty acids to help promote a healthy skin and coat. Feel Good Salmon is particularly beneficial for those with troubled tummies and skin problems.